CPR “in real life” feels very different than watching CPR in the training videos. In the videos or classroom demonstrations on good ol’ Resuscitation Annie, you know instructors, students and you are going to perform staged CPR in a non-life threatening scenario. In real life, things can get confusing pretty quickly – and one of the most confusing things of all is determining whether or not a victim requires rescue breathing and/or compressions – especially if they are gasping (is that considered a breath?) or if their pulse is weak. Sometimes, a victim of cardiac arrest or another medical emergency doesn’t demonstrate symptoms that are as cut-and-dry as you might hope in terms of breathing or responsiveness. 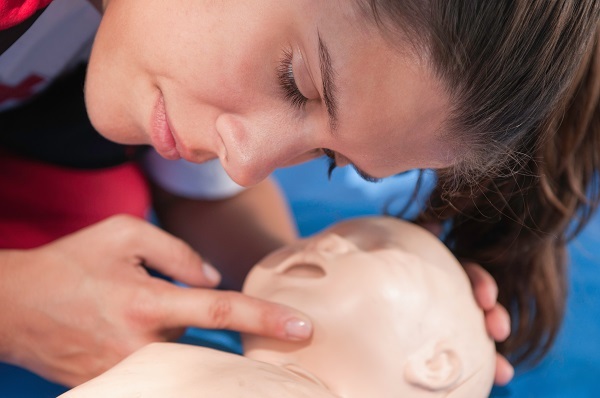 Basic CPR training teaches you to listen for a verbal response and, if there is none, to tap on the victim’s shoulder and, if there is still no response, to check for signs of breathing. This isn’t always as easy as it sounds – depending on your stress level, ambient noise around you or where the victim has collapsed – such as a busy airport, a mall or at a sporting event. Even so, if respiration is taking place, you should be able to feel/hear some amount of breath on your cheek, and in your ear, when you kneel down to assess the situation. In some cases, you may not notice breathing but may hear or witness a victim gasping. Without any response from shoulder-tapping or your shouted queries of, “Are you okay,” you should immediately call 9-1-1 or delegate that task to bystanders. The American Heart Association considers gasping to be the same as not breathing, and they state, “If the person isn’t breathing or is only gasping, give CPR.” An AED should be used if one is available. In other words, while the gasping breath may seem like an indicator the individual is breathing, the AHA doesn’t recognize it as such and recommends proceeding with CPR as you were trained, until EMTs or other medical professionals take over or until the individual begins breathing, responding and/or moving independently. So, to reiterate, an unresponsive person who is gasping for breath should receive bystander CPR – including rescue breathing and chest compressions – until someone with more advanced training takes over. In 2010, a methodology dubbed “cough CPR” gained widespread internet publicity. For some responsive patients demonstrating sudden heart arrhythmia (a potential sign of early stage of cardiac arrest) coughing forcefully and repetitively may help the heart shift back into a healthy rhythm. However, this technique is only applied in exceptional circumstances, and only in hospital/healthcare settings (usually in cardio catheterization labs), where patients are monitored and within close proximity to life-saving equipment. If you’ve come across any internet literature or information about “cough CPR,” consider it inaccurate and, instead, utilize what you’ve learned and practiced in CPR certification courses. Again, your pre-CPR assessment is designed to determine if a victim is breathing or not. We’ve established that “gasping” is not considered breathing and that, if gasping, victims should be treated as if they are not breathing. But what about other, difficult-to-determine “breaths” or signs that simulate “breathing” or not breathing? Here is a list of things you may encounter when someone is in the early- or mid-stages of a cardiac arrest, or in a victim who has collapsed as a result of a cardiac event. When the heart isn’t beating strongly/regularly, blood backs up in the veins that return the blood from the lungs to the heart. Since the heart can’t keep up with the blood supply, fluid leaks into the lungs and those experiencing this shortness of breath can’t breathe well. Typically, those with heart failure experience dyspnea in the midst of regular or increased activity, but it can also occur while sleeping or at rest. The more fluid that builds up in the lungs, the harder it is to breathe. Often, patients with heart disease begin persistently wheezing and coughing. Again, this is not the same as gasping for breath so refrain from performing CPR if it’s not necessary. Get the individual to an ER or Urgent Care ASAP or call 9-1-1 and continue to monitor breathing and their pulse rate. If you come across a collapsed stranger in a public space, your CPR skills could be critical in saving a life. 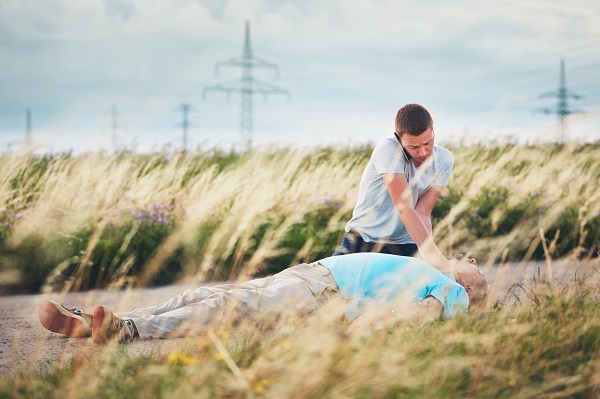 However, recognizing the early- and mid-stages of a cardiac arrest, and seeking immediate medical attention, can prevent individuals from needing CPR in the first-place. Increased heart rate or palpitations, can occur at rest or without any aerobic exercise involved. The more educated the public is, and the more trained we are to recognize and attend to widely-known symptoms or signs of cardiac arrest, the more lives will be saved each year. Are you interested in learning more about CPR, basic first aid or in renewing your CPR training certification? Contact us here at CPR Consultants to sign up for a CPR training class today. You can also review a list of comprehensive CPR certification courses or contact us online.